یلفانی, علی, غلامی بروجنی, بهنام, احمدنژاد, لیلا. (1396). مقایسه تأثیر تمرینات ثبات مرکزی و زنجیره حرکتی بسته بر کنترل وضعیت بدنی دانش‌آموزان کم‌توان ‌ذهنی. سلامت جامعه, 10(2), 33-41. علی یلفانی; بهنام غلامی بروجنی; لیلا احمدنژاد. "مقایسه تأثیر تمرینات ثبات مرکزی و زنجیره حرکتی بسته بر کنترل وضعیت بدنی دانش‌آموزان کم‌توان ‌ذهنی". سلامت جامعه, 10, 2, 1396, 33-41. یلفانی, علی, غلامی بروجنی, بهنام, احمدنژاد, لیلا. (1396). 'مقایسه تأثیر تمرینات ثبات مرکزی و زنجیره حرکتی بسته بر کنترل وضعیت بدنی دانش‌آموزان کم‌توان ‌ذهنی', سلامت جامعه, 10(2), pp. 33-41. یلفانی, علی, غلامی بروجنی, بهنام, احمدنژاد, لیلا. مقایسه تأثیر تمرینات ثبات مرکزی و زنجیره حرکتی بسته بر کنترل وضعیت بدنی دانش‌آموزان کم‌توان ‌ذهنی. 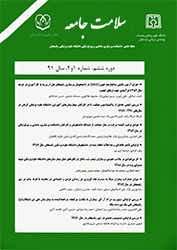 سلامت جامعه, 1396; 10(2): 33-41. 1دانشیار توانبخشی ورزشی، دانشگاه بوعلی سینا، همدان، ایران. 2دانشجوی دکترای آسیب شناسی ورزشی و حرکات اصلاحی دانشگاه بوعلی سینا، همدان، ایران. مقدمه: کنترل وضعیت بدنی نقش مهمی در فعالیت‌های روزمره کودکان کم‌توان ذهنی دارد. هدف از این تحقیق مقایسه تأثیر تمرینات ثبات مرکزی و تمرینات زنجیره حرکتی بسته بر کنترل وضعیت بدنی دانش‌آموزان کم‌توان ذهنی بود. مواد و روش‌ها: در یک مطالعه نیمه تجربی بر روی 45 دانش‌آموز پسر کم‌توان ذهنی، آزمودنی‌ها در سه گروه 15 نفره کنترل، ثبات مرکزی و زنجیره حرکتی بسته قرار گرفتند. گروه‌های تجربی 8 هفته و هفته‌ای سه بار تمرینات ثبات مرکزی و یا زنجیره حرکتی بسته را انجام دادند. در پیش‌آزمون و پس‌آزمون از تست شارپند رومبرگ (Sharpened Romberg) با چشمان باز و بسته برای اندازه‌گیری تعادل ایستای (کنترل وضعیت بدنی) سه گروه استفاده شد. آزمون تحلیل واریانس یک‌طرفه برای تجزیه و تحلیل داده‌ها مورد استفاده قرار گرفت. یافته‌ها: در آزمون تعادل ایستا با چشم باز بین گروه‌های ثبات مرکزی و کنترل (005/0p=) و زنجیره حرکتی بسته و کنترل (007/0p=) تفاوت معنی‌داری مشاهده شد؛ اما بین گروه‌های ثبات مرکزی و زنجیره حرکتی بسته (910/0p=) تفاوت معنی‌دار مشاهده نشد. در آزمون تعادل ایستا با چشم‌بسته نیز بین گروه‌های ثبات مرکزی و کنترل (001/0p=) و زنجیره حرکتی بسته و کنترل (002/0p=) تفاوت معنی‌داری مشاهده شد؛ اما بین گروه‌های ثبات مرکزی و زنجیره حرکتی بسته (420/0p=) تفاوت معنی‌دار مشاهده نشد. نتیجه ­گیری: تمرینات ثبات مرکزی و زنجیره حرکتی بسته تعادل ایستای دانش‌آموزان کم‌توان ذهنی را بهبود می‌بخشند و از این تمرینات می‌توان برای بهبود کنترل وضعیت بدنی دانش‌آموزان کم‌توان ذهنی استفاده کرد. 2PhD student of sports injury and corrective exercises, Bu-Ali Sina University, Hamadan, Iran. Introduction: Postural Control has important role in the daily activities of mentally retarded children. The purpose of this study was Comparing the effect of Core Stabilization Trainings and closed kinetic chain trainings on the Postural Control of mentally retarded students. Materials and Methods: In this case-control study, 45 male mentally retarded students in three groups of Control, Core Stability and closed kinetic chain with 15 people participated. TRN groups performed core stabilization trainings and closed kinetic chain trainings for 8 weeks and three times per week. The pre-test and post-test of Sharpened Romberg test was done for measuring static balance of three groups. ANOVA test used to analyze the data (p≤0.05). Result: Static balance with opened eye results showed significant differences in mean Core Stability and CTL groups (p=0.005) and closed kinetic chain and CTL groups (p=0.007) but showed insignificant differences in mean Core Stability and closed kinetic chain groups (p=0.910). Static balance with closed eye results showed significant differences in mean Core Stability and CTL groups (p≤0.000) and closed kinetic chain and CTL groups (p=0.002) but showed insignificant differences in mean Core Stability and closed kinetic chain groups (p=0.420). Conclusion: Core stabilization training program and closed kinetic chain training program improve static balance of mentally retarded students and can be used for improving postural control of mentally retarded students. Ahmadi R, Hasan D, Hosin BA. The effect of 6 weeks core stabilization training program on the balance in mentally retarded students. Medicina Sportiva: Journal of Romanian Sports Medicine Society. 2012;8(4):2003-8. Woollacott MH, Shumway-Cook A. Changes in posture control across the life span—a systems approach. Physical therapy 1990;70(12):799-807. Olmsted LC, Carcia CR, Hertel J, Shultz SJ. Efficacy of the star excursion balance tests in detecting reach deficits in subjects with chronic ankle instability. Journal of athletic training 2002;37(4):501-6. Johnson EG, Larsen A, Ozawa H, Wilson CA, Kennedy KL. The effects of Pilates-based exercise on dynamic balance in healthy adults. Journal of bodywork and movement therapies 2007;11(3):238-42. Hessari FF, Norasteh AA, Daneshmandi H, Ortakand SM. The effect of 8 weeks core stabilization training program on balance in deaf students 2011; 15 (2): 56-61. Balci P, Tunay VB, Baltaci G, Atay AO. [The effects of two different closed kinetic chain exercises on muscle strength and proprioception in patients with patellofemoral pain syndrome]. Acta orthopaedica et traumatologica turcica 2008;43(5):419-25. Kwon YJ, Park SJ, Jefferson J, Kim K. The effect of open and closed kinetic chain exercises on dynamic balance ability of normal healthy adults. Journal of physical therapy science 2013;25(6):671-4. Carmeli E, Kessel S, Coleman R, Ayalon M. Effects of a treadmill walking program on muscle strength and balance in elderly people with Down syndrome. The Journals of Gerontology Series A: Biological Sciences and Medical Sciences 2002;57(2):M106-M10. Faul F, Erdfelder E, Lang A-G, Buchner A. G* Power 3: A flexible statistical power analysis program for the social, behavioral, and biomedical sciences. Behavior research methods 2007;39(2):175-91. Yim-Chiplis PK, Talbot LA. Defining and measuring balance in adults. Biological research for nursing 2000;1(4):321-31. Jeffreys I. Developing a Progressive Core Stability Program. Strength & Conditioning Journal 2002;24(5):65-6. Aggarwal A, Kumar S, Kalpana Z, Jitender M, Sharma V. The relationship between core stability performance and the lower extremities static balance performance in recreationally active individuals. Nigerian Journal of Medical Rehabilitation 2012;15(1 and 2):11-6. Carpes FP, Reinehr FB, Mota CB. Effects of a program for trunk strength and stability on pain, low back and pelvis kinematics, and body balance: a pilot study. Journal of Bodywork and Movement Therapies 2008;12(1):22-30. Granacher U, Lacroix A, Muehlbauer T, Roettger K, Gollhofer A. Effects of core instability strength training on trunk muscle strength, spinal mobility, dynamic balance and functional mobility in older adults. Gerontology 2012;59(2):105-13. Anoop A, Kalpana Z, Jitender M, Kumar S. Effect of core stabilization training on dynamic balance in non-professional sports players. Indian Journal of Physiotherapy and Occupational Therapy—An International Journal 2010;4(4):18-22. Sekendiz B, Cug M, Korkusuz F. Effects of Swiss-ball core strength training on strength, endurance, flexibility, and balance in sedentary women. The Journal of Strength & Conditioning Research 2010;24(11):3032-40. Kahle NL, Gribble PA. Core stability training in dynamic balance testing among young, healthy adults. Athletic Training and Sports Health Care 2009;1(2):65-73. Petrofsky J, Cuneom S, Dial R, Ashley K, Jenifer H. Core strength training and balance in the geriatric population. the journal of applied research 2005; 5 (3): 423-33. Samson KM, Sandrey MA, Hetrick A. A core stabilization training program for tennis athletes. Athletic Therapy Today 2007;12(3):41-6. Clary S, Barnes C, Bemben D, Knehans A, Bemben M. Effects of ballates, step aerobics, and walking on balance in women aged 50-75 years J Sports Sci Med 2006;5(3):390-9. Piegaro AB. (dissertation). The Comparative Effects of Four-week Core Stabilization&balance-training Programs on Semidynamic & Dynamic Balance. Morgantown WV: West Virginia University; 2003: 56-61. Swaney M, Hess R. The effects of core stabilization on balance and posture in female collegiate swimmers. J Athl Train S 2003; 38:95. Kvist J, Gillquist J. Sagittal plane knee translation and electromyographic activity during closed and open kinetic chain exercises in anterior cruciate ligament-deficient patients and control subjects. The American journal of sports medicine 2001;29(1):72-82. Dannelly BD, Otey SC, Croy T, Harrison B, Rynders CA, Hertel JN, et al. The effectiveness of traditional and sling exercise strength training in women. The Journal of Strength & Conditioning Research 2011;25(2):464-71.